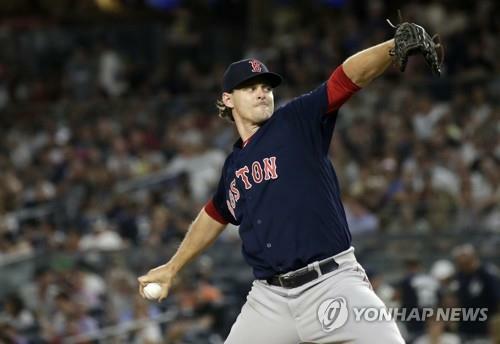 SEOUL, Nov. 27 (Yonhap) — South Korean baseball club Samsung Lions on Tuesday announced their acquisition of former big league pitcher Justin Haley. The Korea Baseball Organization (KBO) team said Haley has agreed to a one-year deal worth US$550,000. He got a $100,000 signing bonus and can make an additional $250,000 in incentives. Starting this offseason, the KBO put in a salary cap of $1 million on first-year foreign players. The 27-year-old right-hander has appeared in 14 major league games, including four this year with the Boston Red Sox. He had a 5.61 ERA in those 14 games, without a win-loss record. In 154 career minor league games, including 141 starts, Haley has gone 43-54 with a 3.42 ERA. Haley joins a staff that finished fifth among 10 clubs with a 5.19 ERA in 2018. KBO teams are allowed to sign up to two foreign players, and the pair that the Lions had in 2018 both struggled. Tim Adleman went 8-12 with a 5.05 ERA, and Lisalverto Bonilla was 7-10 with a 5.30 ERA. Both enjoyed a strong July, but their stretches of effective starts were few and far between. The Lions said Haley has the makeup of a good starting pitcher, thanks to his ability to command many different pitches and his durability.